“Crazy Rich Asians” (2018) is a Hollywood romantic comedy – with an all-Asian cast! It stars Constance Wu of “Fresh Off the Boat” (2015- ) and is based on the 2013 beach novel of the same name. The book sold millions worldwide and is the first in a trilogy by Kevin Kwan. John Chu directs. And not all Asians are alike! Much of the film turns on the differences between Chinese Americans and Chinese Singaporeans. According to Hollywood a film like that should fail in the US – but it soon became the number one film at cinemas. 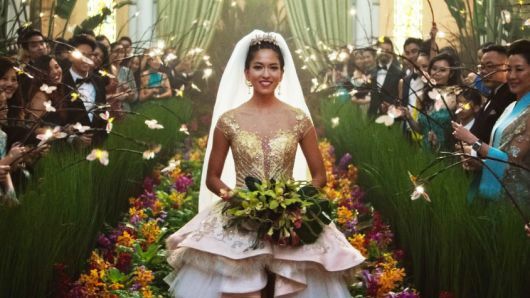 Araminta (Sonoya Mizuno) gets married at the wedding Nick and Rachel attend in Singapore. 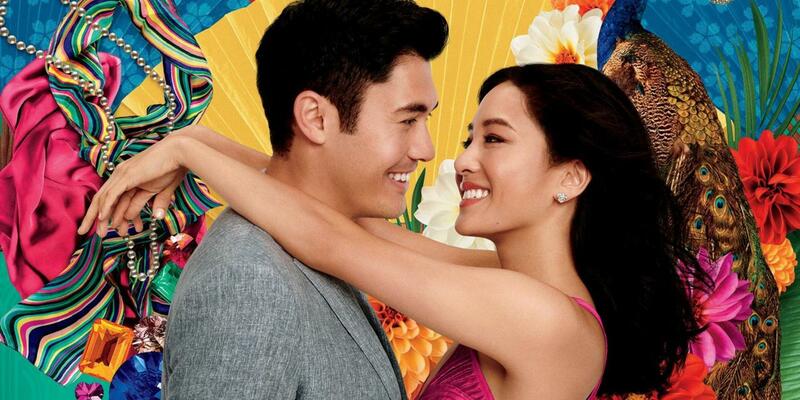 Our story: Rachel Chu (Constance Wu), a Chinese American woman from New York, is invited by her boyfriend Nick Young (Henry Golding) to Singapore to go to a wedding and meet his family. She has no idea how amazingly rich Nick is and soon finds herself in the lion’s den: other women want him and, far worse, his mother, Eleanor (Michelle Yeoh), does not want her to marry Nick. 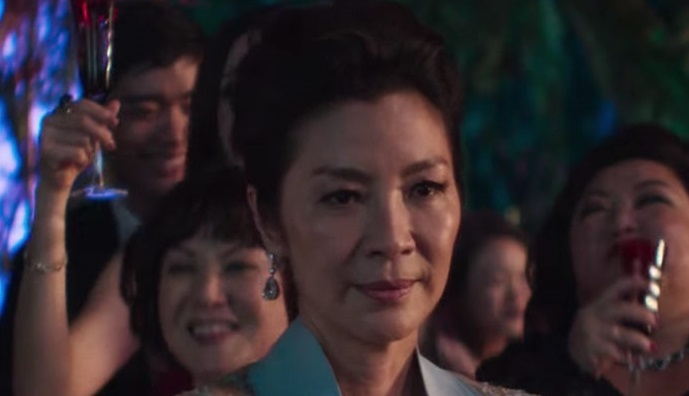 Eleanor (Michelle Yeoh), Nick’s mother. East meets West: Eleanor informs Rachel that she might look Chinese and speak Chinese, but inside she is American. Americans do not put family first or understand the value of love and sacrifice. Eleanor tells her she is not “our kind of people” and will never be good enough. Rachel proves her wrong. Hollywood Whitewashing: As you can imagine, there were some in Hollywood who wanted Rachel to be played by a White woman. After all, who in the US could possibly want to watch a love story that did not star a White woman? Well, as it turns out, there is someone like that: Kevin Kwan, the author himself! 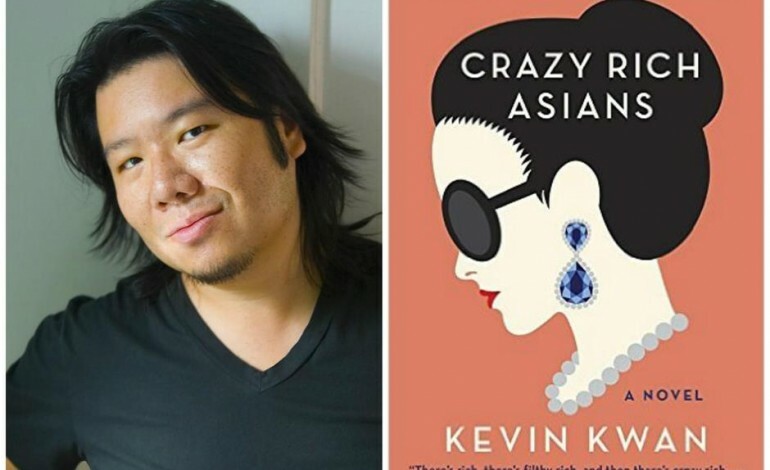 Kevin Kwan and his book in 2017. “Crazy Rich Asians” has done so well that a sequel is already in the works. And there are at least six other possible films with Asian leads that might now get the green light. Maybe we will not have to wait another 25 to 32 years. Poor research on your part. Flower Drum Song had a black woman playing a Chinese aunt. In other words, people of Asian descent should probably be getting between six and sixty times more leading roles than they have now! Major Hollywood studio is the key phrase here. Sounds like a great movie!! Being an Asian, I should watch it! Thanks for the recommendation!! Yes and somehow by watching this it will help overcome the adversity that all Asians face. All pigments and ethnicity of Asians rejoice in this uplifting film because we are all the same with the same social status. This looks like a typical Eastern ‘dorama’. Maybe in decades — to put the ethical perspective aside — people would nostalgise about ‘a whitewashing touch’ of ‘classical hollywood’. Yet, taking a look at a bigger picture, if I were a white racist I would start a joint project with another white racists to make people of colour notice even slightest cases of racism, so that they would be kept busy with depressing and emotionally devastating tasks without going into anything meaningful and big. this kind of popped out of nowhere? Regarding the post. On one end I would love to watch, but feel the film may employ many asian stereotypes. Yet watching it may help society realize that people want and crave diversity in films. Exactly — TeddyBearDaddy has written before about being a poor Asian American. IIRC, he is from one of the ethnic groups that demographically has really struggled in the U.S. and has high rates of poverty, high school dropouts, unemployment, etc. I can see why he would be cynical or bitter about a movie that celebrates rich Asians. @Solitaire and Sharinalr, I do not give a damn about either one of you ladies’ opinions. My post was specifically address to TeddyBear. Additionally, I do not recall him selecting neither one of you to speak on his behalf while he is in a state of self mute. Therefore, I am going to advise both of you henceforth, speak when spoken to and stay the hell out of my lane or else, I’m going to embarrass both of you! So, yes, patriarchy once and for all, ¡patriarchy or muerte! It wasn’t an opinion though. Solitaire explained why. With it being a public forum your response is moot not to mention hypocritical seeing as he wasn’t talking to you either. “I’m going to embarrass both of you!”–ROFL. Will that be before or after you recover from embarrassing yourself. I’m a huge Michelle Yeoh. I don’t want to see her as the antagonist. An another note, it is better to have chosen Constance Wu rather than some white female actress. While I like seeing interracial couples fall in love, there needs to be some Asian romance to dispel the idea that some have of Asian women only going for white men etc. Being a fan of The Joy Luck club, that was one thing I found disturbing. There was this need to pit Asian men and women against each other and display the joys of the Asian woman with a white man. This is similar to the constant push for a divide between black women and black men, though some black men are starting to push this divide on their own and free of any white influence. Yep and I would say more than I have, but won’t bother. Let him scratch whatever itch he has been having. Ignore if you wish, but a little word of advice from the comment policy. This is regardless of how easy it is to understand what you say. You are playing it safe by using little phrases, but a now banned commenter started that way too. Well said. And with a generosity, too, for I wouldn’t waste my time or words on anyone of those two ladies — though sharinaIr often seems to be a male. I wasn’t talking to you. My comment was to Sharina. I don’t need your permission to comment on something TeddyBearDaddy said. I don’t need his permission, either. Ha! That’s hysterical. Women get indoctrinated from childhood to put everyone else before themselves. Meanwhile men are so minded on “being beneficial to others” that they think they can tell women when and when not to speak! That’s trying to have control and power, not being beneficial and kind. Spoken like a racist white male. I’m sure being so erudite and all that you are aware it is a very common slur against black women to say they are too masculine. Maybe you are one of those conspiracy theorists who thinks Michelle Obama is a man, too? Yep. ARN reminds me of LOM in several ways. I concur, and just as you’re unsure about this individual’s gender or blurred gender, I am also wondering whether or not sharinalr is a certified palm reader or mind reader. In any event, this one sharinalr seems to be quite certain about what TeddyBear posted. Therefore, I could only surmise that he/she had a sudden urge to place recently learned telepathic skills on display. But whatever biological pulse moved her to action, her intended results to sway or persuade others that Teddy’s post was merely “sarcasm”, obviously ended in a complete failure. I love Michelle Yeoh, too, and I don’t really like the idea of her being the antagonist — but on the other hand she is now an older woman in Hollywood’s eyes, and middle-aged women have trouble even getting cast in movies, more so if they are POC. So this is fantastic in that sense as she seems to have a large supporting role. And who knows, maybe she enjoyed playing against type and getting to be a villain, which actors often say are the more interesting roles to play. “though sharinaIr often seems to be a male.”—Yep I am all male. My comments ooze of masculinity. At any rate, i see you are still upset you got caught in those lies about calling names and then managed to display it here all while concocting a lie about how you are not going it here too. All you have is name calling so enjoy. “In any event, this one sharinalr seems to be quite certain about what TeddyBear posted.”—I’m certain because several times he has posted about his situation as poor Asian and how not all are the same. I am also certain that he has concluded that responding to you is pointless because you can’t even admit when you are wrong. Just go on tangents like a loon. “but whatever biological pulse moved her to action, her intended results to sway or persuade others that Teddy’s post was merely “sarcasm”, obviously ended in a complete failure.”—My intent wasn’t to persuade others as it is obvious other people either got it or didn’t care. Stop excusing you didn’t. “Spoken like a racist white male.”—Exactly! You have been calling him on his bs way before I have and in the same manner yet he was all too happy to decide I was a male with his black women stereotype. On top of that he was way too invested in arguing with a teenager over something said about white men. I guess he now wants black male support. Either way it won’t shame me into not calling him out. “Yep. ARN reminds me of LOM in several ways.”—He reminds me of x. He used to always twist definitions with the intent of having his behavior excused. On a side note, this exchange also makes me understand a bit how k(won’t say his full name) might have felt about being over talked by people who don’t share his experience as an Asian. Not excusing his behavior, but I get it. Yeoh is gorgeous in the photo abagond has up. She does not seem to have aged or simply got better looking over time. She will always be Yu Shu Lien in crouching tiger hidden dragon to me. His behavior went way over the top at the end, but he wasn’t totally imagining things either. That movie could have only been better if it had simply been three hours of Michelle Yeoh and Zhang Ziyi sparring. Their fight scene with Yeoh pulling all the different weapons is so awesome! You know, I think it also is better to have Constance Wu up against Michelle Yeoh because if they had chosen a white actress, then the mother’s objections would have been based on race, but this way it highlights the distinction between Asian Americans and Asians in Asia, which is something a lot of white U.S. moviegoers need to see. Although if they had gone with a white actress, it would have been a AMWF couple which also would have been good to see on screen instead of the typical opposite. Judging by the ranting of SharinaIr, (s? )he is not a mind-reader, but rather a bs-reader instead, so my conclusion is that what that user usually usurps as an ‘intention being read’ is nothing but the very same substance I give about that user’s ranting. They are boring and predictable, running around as headless hens. “His behavior went way over the top at the end, but he wasn’t totally imagining things either.”—It did, but I believe he wanted to discuss unpopular topics and often felt boxed in being on a majority black blog. It can be a balance not wanting to step on toes, but also not wanting to be silenced. Eventually you choose to be more vocal than silent. Sometime being agreeable creates a sense of anger and resentment and I do believe that is what happened with him. “That movie could have only been better if it had simply been three hours of Michelle Yeoh and Zhang Ziyi sparring.”—Literally the best fighting scene of all time. “this way it highlights the distinction between Asian Americans and Asians in Asia, which is something a lot of white U.S. moviegoers need to see.”—You make a very good point, but I will add that black Americans need to see this as well. It is often concluded, and I have said this as well, that they can go back. The tensions between Asians and Asian Americans are not fully realized and it is beyond time that this discussion gets brought to the table. Even for me it is hard to accept the trouble it would be for Asian Americans to transition in Asian countries. A part of me still wants to see it as “they have somewhere to go back to.” Mainly because black Americans typically don’t have this luxury of a “place.” However, after years in the US neither do Asian Americans. You made very good observations about K.
The second best fighting scene of all time is Zhang Ziyi in the restaurant, which considering what happened upthread is feeling oddly apropos. Speaking of not wanting to step on toes, I did originally write “non-Asian Americans” instead of “whites” but changed it. Not only have I been in the midst of that argument more than once here before but it is actually the topic that brought me out of lurking, back during the Game of Empires discussions. I didn’t feel like inadvertently setting off another round today. I really appreciate what you said above. “You made very good observations about K.”–Thanks. At the end of the day, I truly hope he finds some sense of peace. “I didn’t feel like inadvertently setting off another round today.”—I can understand that. But when it there ever a best time to say it? Some people just want to be mad no matter what you say or how you say it. However, it does not stop the reality that it needs to be said. We learn from each other here and we can’t learn if it is not spoken. Sometimes it blows up, people think it over, and return with a fresh view. I did and I am thankful for it. Another thing I have considered with this movie is that idea that the Asian and Asian American divide will be viewed as a joke. This is a romantic comedy and the idea of a comedy prompts people not to take things as serious as they should. This subject needs to be taken in a very serious manner and Asians deserve a movie that displays that. While black panther is fiction, it took a serious approach to addressing the divide between Africans and African Americans. I should watch the movie to give a full review, but it gives me the sense that Asian issues should not be taken seriously and that is not something I am okay with being pushed. True, but sometimes you don’t want to be seen as harping on a subject, either. And some days you’re already tired because you’ve got men telling you when you can and cannot speak, and it just isn’t the day to fight on multiple fronts. I think he had a pressing need to feel both heard and accepted. He got very emotionally invested and couldn’t step back and have patience. What I have been starting to understand on this topic is that when black Americans tell other POC “you can go back, we can’t” is that it is coming out of a raw place of pain and loss that is almost overwhelming. And the anger that is sometimes expressed isn’t really so much at those other POC as it is just from the terrible grief over not knowing who you are and what people you come from. And any discussion is going to need to be cognizant of that very real pain. But also while ruminating just now, I realized that Americans in general have a very bad habit of telling each other: “If you don’t like it here, you can always go back where you came from.” White Americans are the worst, I’m not denying that, but I mean white people don’t just say that to non-whites. We say it to and about each other. I wonder if other immigrant-founded nations have that bad habit, too, or if it’s just the U.S. But it’s a mindset we really need to get away from, because except for the most recent arrivals none of us could just pick up and go back and not feel like a complete foreigner in another country. Very valid concerns. The only thought I have to add is that at least the issue is getting displayed at all. That is a baby step but a first step. Hopefully even though it is a comedy, people will come out of the theater thinking, “Hey, Asian Americans are really truly Americans and even Asians in Asia think so.” That would be a start. “True, but sometimes you don’t want to be seen as harping on a subject, either etc.”—I understand. After a while it is becomes tiring trying to explain the same thing to people. This is especially true when their mind is made up. I can relate as I felt the same when I was not commenting regularly. I lurked and wanted to participate but would often not because I was too tired to get involved. However, on the discussion of men (boys for me) telling us women when we can and can not speak reminds me of a post on brothawolf. The post was based on a youtube video (by black man) regarding a statement of “straight black men are the white people of black people.” I would go further on the topic, but don’t want to go off topic. “What I have been starting to understand on this topic is that when black Americans tell other POC “you can go back, we can’t” is that it is coming out of a raw place of pain and loss that is almost overwhelming. “—This is a good observation and may be very true. It can be very hurtful watching other group represent their cultural backgrounds and not have one of your own to represent. “I realized that Americans in general have a very bad habit of telling each other.”—This is one of many bad habits that Americans have. The one that is most troubling for me is seeing everyone as either Asian, black, or white. The reason it is most troubling because it has become universal in a sense and a bit hard to escape. One major debate is the blackness of afro Hispanics. It can be hard to get people to understand that they are not saying they are not black. Black to many of them equals American. “But it’s a mindset we really need to get away from, because except for the most recent arrivals none of us could just pick up and go back and not feel like a complete foreigner in another country.”—Fully agree, but fear of losing what is believed to be ones own bring out the worse of this mindset. “That would be a start.”—Agreed. Better to start somewhere than to not start at all. American climate seems to be shifting and it may actually be a good shift. People and oddly Hollywood is starting to take notice in the flaws and disparities dealing with racial inequalities. Thank you for the link to the HuffPo article. I also looked up the original essay she was responding to. Very interesting and compelling. I have been lurking at Brothawolf’s blog for a few months now, and I noticed right away how strong of an ally he is trying to be, both for black women and for women’s rights in general. If you feel like saying more, I would be happy to follow you over to the Open Thread. Yes, I can see how that would hurt. To an extent I understand because I do often envy the people who have just one ethnic background with strong ties to their culture of origin, and how they can march in those parades singing their people’s songs and dancing their people’s dances. But I have to stay mindful of the fact that for me it is just a little envy, not an aching void caused by the trauma of an inhumane crime against my ancestors. I don’t know quite how to word this, but watching the “you can go back, we can’t” arguments, I got the sense that it would be helpful if the Asian participants tried to give more acknowledgment to that historical wound and if the black participants tried to not talk over them so much about that wound. Right — what they are saying is that they aren’t Anglo, not that they aren’t black. It is difficult for most non-Hispanics to get their heads around the idea that people from the U.S. have an Anglo culture regardless of race and people from Latin America have a Hispanic culture regardless of race. I never thought to ask you before — does your husband’s family still have strong enough ties that they feel they could go back if necessary? It does seem that way. I’ve been noticing a similar shift in fiction. There are increasing efforts to make room for diverse voices and to achieve equal representation. Brothawolf truly is a gem. I respect him and admire his compassion in all aspects. As for speaking more on said subject matter, I think I will take you up on that offer. To be honest, I see it as a level of envy too. Eventually you want that cultural connect so bad you envy the people that have it. Some black Americans I have encountered will throw out racial slurs and even boast about being American. This is often done in an angry manner meant to hide the hurt and envy. For example, I saw an exchange on an African blog where a Black American stated, “I am not African. I don’t live in a hut.” It was beyond disrespectful. I have seen similar responses to Hispanics and Asians. “I got the sense that it would be helpful if the Asian participants tried to give more acknowledgment to that historical wound and if the black participants tried to not talk over them so much about that wound.”—I agree. I think we all have to get to a point to acknowledge that white supremacy has done some messed up stuff for all POC. Yes, blacks will have it worse as it is enforced that they are beneath, but Asians will still face similar discrimination if not the same in certain instances. “does your husband’s family still have strong enough ties that they feel they could go back if necessary?”—Yes, in fact he is currently in Mexico now. His father left for the states to work when he was younger, but his mother stayed in Mexico to raise him and his siblings. When his mother died he took responsibility for his siblings. Some stayed in Mexico, while others moved to the states. “There are increasing efforts to make room for diverse voices and to achieve equal representation.”—And trust me when I say….I am loving it. “To be honest, I see it as a level of envy too. Oh, yes, I didn’t mean that there wasn’t envy on your part. I meant that for me the only emotion is wistful envy and so I tell myself, “Well, that’s what happens when your ancestors left 300 – 400 years ago; a lot gets forgotten.” But I don’t have all those other feelings to cope with, the very justifiable anger and hurt over having been forcibly ripped from that Old World culture. I have experienced a similar type of envy, but I can never fully understand the rest of what underlies your feelings of cultural disconnect and loss. I hope that makes sense. I agree. It can be difficult to really listen to and hear each other, but it’s the only way to learn and grow and move forward. I wish I had thought to ask that before. It makes a lot of sense that, if the very person you’re closest to in life would easily be able to go back, that might color your perception of the general issue. He sounds like a very strong, responsible, and caring person. My most recent reply to you is parked in automod, and I didn’t curse, not once! “I hope that makes sense.”—It does. “I agree. It can be difficult to really listen to and hear each other, but it’s the only way to learn and grow and move forward.”—Very true. But it seems when leeway is made, then something happens to destroy it. This is where people have to understand that people are people. Yes, anti-black attitudes exist in many different cultures, but there has to be a point of listening and understanding the underlining factors behind these ideas. “I wish I had thought to ask that before..etc.”—-Now that you think about it, that is very much true. They can go back and that may have clouded my judgement on others ability to go back. Going back is only possible if ties remain with the home country. I’m actually curious on how many generations must live in the United States before you are considered American? Once you are born there do they consider you to not be like them? “He sounds like a very strong, responsible, and caring person.”—He is. I was very hesitant in meeting him and the other family members due to the idea of antiblack attitudes, but they have been super welcoming. However, I think the strong welcome I get from them blinds me at times to the antiblackness of Hispanics. Though even outside of my family, I have gotten warm welcome from Hispanics. But just for a personal comparison, your husband grew up there and keeps strong ties and goes back for visits. Mine has been exactly once, when he was still in high school, almost 40 years ago. He doesn’t speak the language, and although English is fairly widely spoken in the Philippines, not everyone speaks it and he did have some trouble communicating and understanding what was going on around him. There are some people who even though they may be second or third generation American, they still have much stronger ties than he does because their parents were able to send them to the home country every summer for a long visit and/or their parents have business ties there and do a lot of travel back and forth. That’s wonderful, glad to hear it! I could see how that would be the case. There are always some people who are the exceptions to the rule, and if you’re mostly in interaction with those exceptional people, it’s easy to start thinking of them as the norm.